Civilisation changes helped to improve living conditions in societies but at the same time they posed numerous new threats to the health of a contemporary human. The aim of the work was to define differences in the prevalence of metabolic syndrome risk factors in male and female sports university students with different levels of physical activity. The study included 164 female and 174 male first-year students of the Department of Physical Education and Sport in Biala Podlaska. Body weight and height, circumference of waist, hips, arm and calf as well as elbow and knee breadth were measured. BMI and WHR were calculated. Fat tissue was assessed and the levels of glucose, lipid profile, pulse and blood pressure were taken. Moreover, physical activity and a diet of students were determined. Female and male students of physical education and sport demonstrated a higher level of daily physical activity, which was statistically significant compared to other students. However, different levels of physical activity did not influence their diet or the results of their biochemical and physiological tests. Healththreatening factors were noted in a significant number of the examined women and men. Key words: Students, physical activity, body build, metabolic syndrome. Los cambios sociales han ayudado a mejorar las condiciones de vida de la comunidad, pero al mismo tiempo han causado la aparición de muchos riesgos para la salud del hombre, los cuales antes habian sido desconocidos. El propósito de este estudio es identificar las diferencias en la frecuencia de los factores causantes del síndrome metabólico, específicas para estudiantes de ambos sexos de una universidad de deporte, contienen actividad física. Se han examinado a 164 chicas y 174 chicos de primer curso de la universidad de deporte en Biała Podlaska. Han sido pesados, y su altura, cintura, caderas, brazos, piernas y el ancho y la base del brazo y la rodilla han sido medidas. Se ha calculado el tamaño del IMC y la RCC. Se ha estimado la cantidad de grasa corporal y se ha determinado el nivel de glucosa, perfil lipídico, la frecuencia cardíaca y la presión arterial. Se ha especificado la actividad física y la dieta de los estudiantes. Los estudiantes de educación física y deporte, en relación con los estudiantes de otras carreras, se caracterizan por un nivel significativamente más alto de la actividad física diaria. Por el contrario, los diferentes niveles de la actividad física no se reflejan en sus hábitos alimenticios, ni en los resultados de la investigación bioquímica y fisiológica. En una gran cantidad de mujeres y hombres encuestados se han observado factores de riesgo para la salud. Palabras clave: Estudiantes, la actividad física, la constitución corporal, el síndrome metabólico. Academy of Physical Education in Warsaw, Department of Physical Education and Sport in Biala Podlaska, Poland. In many countries civilisation changes brought about a huge progress in science and technology, which influenced changes in the lifestyle of the whole societies. A considerable improvement in everyday life conditions posed numerous new threats to the health of a contemporary human. They may include, inter alia, metabolic syndrome defined as a complex of interrelated metabolic syndrome risk factors such as obesity (mainly abdominal obesity), increased glucose levels, hypertension, lipid disorders, etc. Considerable increase in the prevalence of metabolic syndrome was noted in the United States. Mozumdar and Liguori (1) noted that this condition occurs in 34.3% of adults over 20 years old and the number increases with age. This type of research was also conducted in selected European countries (2). It proved that this problem concerns 2.3% to 19% of men and 7.3% to 28.4% of women in various age groups. Metabolic syndrome occurs not only in the countries well-developed economically but also in developing countries. In Poland such effects of civilisation changes were noted in 19.5% of men and 18.6% of women (3). However, this problem regards not only adults but it is also more and more common among children and youth (4). The main causes of the metabolic syndrome, apart from genetic predispositions, include low physical activity, improper diet, increasing pace of life and stress connected with it. Simultaneously it was proved that regular physical activity makes it possible to lower the risk of metabolic syndrome considerably (5). It is estimated that in the world low physical activity accounts for 20% of cardiovascular diseases and 37% of cardiovascular mortality (6). In scientific literature there are also studies in which authors did not find correlation between the level of physical activity and the frequency of occurrence of metabolic syndrome factors (7,8). Therefore, it is interesting to check whether metabolic syndrome risk factors occur in students who practise sports with various intensity. Thus, the aim of the work was to define differences concerning the prevalence of metabolic syndrome risk factors in male and female sports university students with different levels of physical activity. In May 2012 the research was carried out on 164 female and 174 male first-year students of the Department of Physical Education and Sport in Biala Podlaska from such fields of study as physical education, sport, tourism and recreation, physiotherapy and cosmetology. The numbers of subjects divided according to the fields of study are shown in Table 1. Height (Ht) and weight (Wt) were measured to the nearest 0.1 kg and 0.1 cm, respectively, without shoes and with light clothing. Body mass index [BMI = weight (kg) ⁄height (m2)] was calculated. World Health Organization classifications were used to define BMI categories: underweight (<18.5 kg/m2), normal (18.5-24.9 kg/m2), overweight (25.0-29.9 kg/m2), and obese (≥30 kg/m2). Waist circumference was measured using a steel measuring tape, with measurements made halfway between the lower border of the ribs, and the iliac crest in a horizontal plane. Hip circumference was measured at the widest point over the buttocks. Men with a waist circumference 94–101.9 cm and women with a waist circumference 80–87.9 cm were classified as overweight, whilst men with a waist circumference ≥102.0 cm and women with a waist circumference ≥88.0 cm were classified as obese. WHR was obtained by dividing the mean waist circumference by the mean hip-circumference. Men with a WHR 0.90–0.99 and women with a WHR 0.80–0.84 were classified as overweight, whilst men with a WHR ≥ 1.00 and women with a WHR ≥ 0.85 were classified as obese. Fat tissue was estimated with bioelectrical impedance. The measurement was performed on the right side of the body using 800- A and 50-kHz alternating sinusoidal current and a standard tetrapolar technique (BIA 101 Impedance Analyzer, AKERN, Florence, Italy). BIA was performed under standardised conditions: a quiet environment, an ambient temperature of 22° C – 24° C and after resting in the supine position for 20 min. After the electrode sites were cleaned with isopropyl alcohol, electrode patches using a self-adhesive conducting gel (Kendal Care, Resting ECG Electrode, TYCO Healthcare Group LP, Mansfield, MA, USA) were attached. The electrodes were placed proximal to the metacarpal phalangeal joints in the middle of the dorsal side of the right hand, and just below the transverse (metatarsal) arch on the superior side of the right foot. The wholebody impedance vector components, resistance (R) and reactance (Xc), were measured at the same time. Fat mass and skeletal muscle mass were determined using BODYGRAM-Software (AKERN S.r.I. Bioresearch, Florence, Italy). Venous blood (ca. 5 mL) was taken from an elbow vein in the morning after overnight fasting. The blood was taken from patients in a sitting position to EDTA collection tubes and then plasma was extracted by centrifugal separation (3000 x g for 10 mins in 4ºC). Samples of plasma were frozen in the temperature of -80°C until analysis. The levels of glucose and lipid elements in blood plasma were marked according to spectrophotometric method with the use of “Marcel Media Bio” spectrophotometer (Merazet Poland). It was marked in the temperature of 37 ºC with the use of reagents from RANDOX (Crumlin, United Kingdom). LDL cholesterol level was marked with the Friedewald method resulting from the following formula: LDL cholesterol (mg/dL) = Tchol – TG/5 – HDL cholesterol. In order to mark total cholesterol level (TC) and triglycerides (TG) the CardioChek analyser from Polymer Technology Systems Inc. (USA) was used. In order to estimate the risk of arteriosclerotic changes the percentage of subjects (%) whose mean levels of TC and TG were higher from 190mg/dL and 150 mg/dL respectively was calculated. Pulse and blood pressure were measured using an automatic sphygmomanometer OMRON (i-Q 142), in a seated position after the participant had rested for at least 5 min. After measurement of the circumference of the mid-upper arm, a cuff of suitable size was applied to the participant's exposed upper arm (the arm not used for blood collection), which was supported by the table at heart level. Participants were classified as hypertensive if they, had a mean systolic reading ≥140 mmHg or a mean diastolic reading ≥90 mmHg. Physical activity was assessed with the use of Seven-Day Physical Activity Recall (SDPAR) questionnaire. In this work the authors used data concerning mean daily intensity and time devoted to physical activity connected with duties at the university (SDPAR5) and physical activity on the days with no classes (SDPAR2) as well as mean daily values from the whole week before the examination (SDPAR7) (9). Data concerning the diet were collected on the basis of three questionnaire interviews regarding the previous 24 hours before the interview. On the basis of the data mean daily energy intake was calculated in the computer programme DIETA 5.0 based on the national tables of food composition and nutritional values (10). The results were compared with the norms for Estimated Average Requirement (EAR) taking into account age, body weight and mean daily physical activity level (PAL) calculated as the quotient of total energy expenditure (TEE) and basal metabolic rate (BMR). Total energy expenditure in kcal/day was estimated with the use of the Seven-Day Physical Activity Recall (SDPAR) questionnaire, while basic metabolic rate (kcal/day) was calculated with the use of the formula of FAO/WHO/UNU (11). In order to assess the adequacy of energy intake, the percentage of people (%) whose food portions did not cover the norms of Estimated Average Requirement (EAR) was calculated (12). The research was conducted according to the guidelines included in Helsinki Declaration and was accepted by the Senate Ethics Commission at the University of Physical Education in Warsaw. On the basis of the analysis of study curricula the cohort of females and males was divided into groups taking into account the number of sports classes per week. The first group (Group I) included male and female students from sport and physical education (10 hours of sports classes per week), while the second group (Group II) included male and female students from tourism and recreation, physiotherapy and female students from cosmetology (2 hours of sports classes per week). The collected material made it possible to note slight differences concerning calendar age between the examined female and male students of the Department of Physical Education and Sport in Biala Podlaska (Table 2 and 3). The calculated mean age of the females from Group I was 20.61±0.88 years, while from group II – 20.56±1.04 years. The youngest of the examined female students was 19.08 years old, while the oldest one was 25.71 years old. The mean age in the group of male students of physical education and sport was 20.92±1.25 years, while among physiotherapy and tourism and recreation students it was 21.18±1.08 years. The age range of the examined males was between 18.69 and 25.11 years. M - mean; SD-standard deviations; n - number of subjects; % - percent of subjects; t-value - the value of Student's t-test ; * statistically significant difference at the level of p< 0.05; Group I: physical education, sport (n 48), Group II: physiotherapy, tourism, cosmetology (n 116). Female and male students of physical education and sport demonstrated a higher (statistically significant) level of daily physical activity calculated from the days on which they participated in sports classes at the university than students from other fields of study (females – by 12.47 MET, males – by 7.93 MET). The results calculated from all weekdays were also higher for them (females – by 11.01, males – by 6.67 MET). For the results concerning free days, statistically significant difference was noted only in female students (by 7.35 MET), while in male students it was at the level of only 3.52 MET. Higher physical activity was also reflected in the pulse values. The pulse was significantly lower in physically active females (by 5.91 contraction/minute) and males (by 4.08 contractions/minute) than in their less active counterparts. A different level of physical activity was not reflected in the diet of students, which was assessed on the basis of daily energy intake. The difference between the analysed groups was not significant at the level of 64.87 kcal/day in females and 7.41 kcal/day in males. While assessing somatic features, it was noted that females studying physical education and sport demonstrated a significantly lower body height (by 2.37 cm) and BMI (by 1.51 kg/m2) compared to the female students from other fields of study. However, it should be noted that the latter difference was caused by the amount of active tissue, since the amount of fat tissue was insignificantly lower. This assumption was confirmed by the results of males since the differences between the groups concerning body height, weight and BMI were slight. However, the amount of fat tissue was significantly lower (2.57%) in more physically active students. For the remaining anthropometric factors the differences were slight, so while characterising the examined females and males, it might be concluded that the levels of somatic features and WHR were similar. Moreover, no significant differences were noted between the values of biochemical and physiological examination results. Male students from sports fields of study demonstrated insignificantly lower levels of total cholesterol, triglycerides, systolic and diastolic blood pressure and glucose compared to their peers from other fields of study. However, in women reverse correlations were noted. The presented analysis of results based on arithmetic means and standard deviations does not reveal how many subjects demonstrated referential values for the assessed health indices. 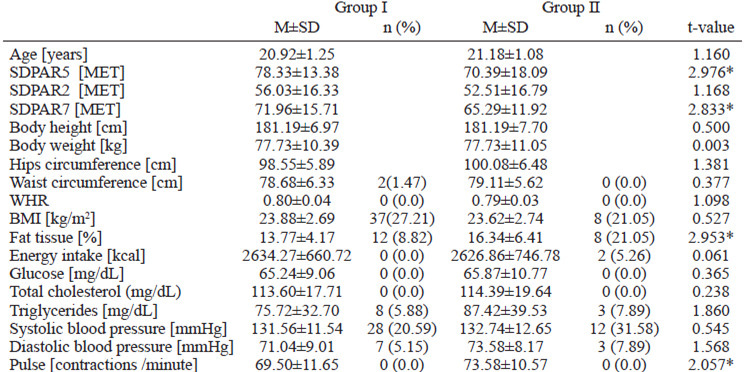 Therefore, in the following part of the work, the number and percentage of subjects demonstrating each of the metabolic syndrome risk factors are presented with regard to referential values. The results of the whole population are described and the results for female students are presented in table 2, while for male students in table 3. Statistically significant difference at the level of p< 0.05 between the groups was noted only in the number of females with excessive fat tissue. Individual distribution of BMI values revealed that 22 females (13.41%) and 45 males (25.86%) demonstrated excessive body weight. However, it should be highlighted that among subjects with a high level of physical activity, high levels of body mass index may be caused by the amount of active tissue. Therefore, the analysis also included the amount of fat tissue whose values above 26% were noted in 25 female students (16.46%) and above 20% in 20 male students (11.49%) (15). Taking into consideration the value of WHR, it was noted that only in 16 female students (9.76%) there exists a higher risk of metabolic syndrome. The risk also increases in females with a waist circumference bigger than 88 cm, while in males – above 94 cm. Such values were noted in 4 female students (2.44%) and 2 male students (1.15%). The analysis of daily energy intake taking into consideration age, body weight and mean daily level of physical activity revealed that 5 female students (4.31%) and 2 male students (1.15%) exceeded referential values in their diets. In turn, no considerable prevalence of increased biochemical blood parameters was noted. Irregularities regarded total cholesterol level (n 1 – 0.61% of females) and triglycerides (n 19 – 11.59% of females and 11 – 6.32% of males). In all the students from the Department of Physical Education and Sport in Biala Podlaska the level of glucose fell within the norm. An increased systolic blood pressure was noted in 8 females (4.88%) and 74 males (42.53%), while increased diastolic pressure was found in 9 females (5.49%) and 10 males (5.75%). Taking into account referential values of WHO and EGIR (13,14), it must be concluded that metabolic syndrome factors were noted in 69 females (42.07%) and 63 males (36.21%) under observation, including 11 (22.92%) female students from the more physically active group and 58 (50.0 %) from the less active group (table 4). Among male students the numbers were 45 (33.09%) and 18 (47.37%), respectively. The occurrence of 2 and more metabolic syndrome factors was noted in 3 females (6.25%) and 9 males (6.62%) from group I and in 15 females (12.93%) and 8 males (20.6%) from group II. 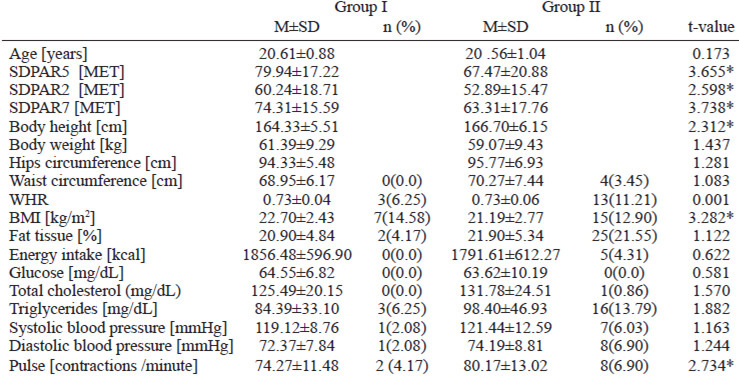 It should be highlighted that no significant differences concerning the frequency of occurrence of metabolic syndrome factors were noted between the analysed groups. The only exception was the amount of fat tissue of women, where significant differences were noted (χ²= 7.069). The correlations between body build and field of study described in literature indicate that compared to other fields of study, students of physical education demonstrate a higher level of somatic features and a higher level of physical activity, which was confirmed in our observations. They also have a high level of motor development and development factors, which is reflected in higher physical efficiency than in students from other fields of study (16). While interpreting this fact, the quoted authors focus on the significance of the selection factor in the university admittance process. Therefore, it might be assumed that the described differences in the development of somatic features should be considerable and the groups of physically active females and males will not include subjects with metabolic syndrome risk factors. However, these assumptions were not confirmed in this research. In the analysis of anthropometric factors significant differences were noted only with regard to BMI in females and to fat tissue in males. Significant differences concerning BMI in female students and similar levels of this index among males may have been caused by the amount of active tissue, and not by overweight, which is confirmed by the results of research on fat tissue. Similar results were noted by Reuter et al. (17), who examined tissue composition in Brazilian students. However, it must be highlighted that due to a low number of candidates, the examined youth did not undergo any selection process while being admitted to university, which may have influenced the results. Moreover, Mleczko and Januszewski (18) highlighted the fact that currently studies at the University of Physical Education are taken up by individuals who are better developed as far as their basic somatic features are concerned rather than their motor abilities, which is compliant with the national secular trends (19). It is caused, inter alia, by a lower motor potential of upper-secondary school graduates who apply to this field of study. Therefore, it is understood that no significant differences between the analysed groups were noted with regard to mean WHR, diet and biochemical factors characteristic of metabolic syndrome. Only mean pulse shows better adaptation of the circulatory system to physical loads. However, despite similarities between the analysed groups, individual results of females and males helped to recognise metabolic syndrome. The described research results revealed higher values of at least one factor than referential values and the number of subjects with a diagnosed metabolic syndrome. The increased risk of cardiovascular diseases noted in the students from Biala Podlaska is not a unique phenomenon in this age group, which was noted by de Freitas et al. (20) in his review of data from various countries of the world. However, it should be remembered that there are various opinions concerning the selection of metabolic syndrome risk factors. The research results available in literature are based on different criteria and risk factors. The most frequent ones are the recommendations by WHO (13), EGIR (14) etc. Moreover, it might be assumed that differences concerning physical activity are caused by the curriculum, and not by one’s own needs, since physical education and sport students have at least 10 didactic hours of physical education classes per week, while at the remaining fields of study only 2 hours of this type of classes are realised. Thus, it is understandable that there exist statistically significant differences in physical activity. During sports studies an increased number of practical classes does influence the level of somatic features. Thus, it might be assumed that clearer differences between the assessed groups of females and males can be noted among older students, since studying at the sports university creates habits of increased physical activity. It is a well-known fact that physical exercise may influence energy balance and tissue composition as well as widely understood health indices. Moreover, physical activity is a significant element of the strategy aimed at reducing waist circumference (and body weight at the same time), and it exerts a positive influence on the values of systolic blood pressure, triglycerides concentration and HDL fraction of cholesterol. The level of the aforementioned changes depends on the time devoted to physical exercise and on their intensity. No significant differences concerning differences in the somatic build and the frequency of occurrence of metabolic syndrome factors between groups of female and male students with different levels of physical activity were noted. The lack of differences between both groups may be caused by the present secular trends in the development of the youth in Poland, improper selection for university or a short period of declared physical activity. Health risk factors were noted in a considerable number of the examined females and males, so they should be taken care of in order to prevent and treat metabolic syndrome complications. The research material was collected within statutory activity of the University of Physical Education in Warsaw no. 172 financed by the Ministry of Science and Higher Education. Mozumdar A, Liguori G. Persistent Increase of Prevalence of Metabolic Syndrome Among U.S. Adults: NHANES III to NHANES 1999–2006. Diabetes Care. 2011; 34 (1): 216-219.
van Vliet-Ostaptchouk JV, Nuotio ML, Slagter SN, Doiron D, Fischer K, Foco L, et. al. The prevalence of metabolic syndrome and metabolically healthy obesity in Europe: a collaborative analysis of ten large cohort studies. BMC Endocr Disord. 2014; 14: 9. Wyrzykowski B, Zdrojewski T, Sygnowska E, Biela U, Drygas W, Tykarski A. Epidemiology of the metabolic syndrome in Poland. The results of the program WOBASZ [Epidemiologia zespołu metabolicznego w Polsce. Wyniki programu WOBASZ.] Kardiol Pol. 2005, 63 (Supl.4): 1–4. Kolarzyk E, Janik A, Kwiatkowski J. Evaluation of the risk of metabolic syndrome among overweight and obese children. Part I. Anthropometric and biochemical factors of the risk of metabolic syndrome development. Prob Hig Epidemiol. 2011; 92 (4): 741-745. Edwardson CL, Gorely T, Davies MJ, Gray LJ, Khunti K, Wilmot EG, et al. Association of Sedentary Behaviour with Metabolic Syndrome: A Meta-Analysis. PLoSONE. 2012; 7 (4): 34916. Levi F, Chatenoud L, Bertuccio P, Lucchini F, Negri E, La Vecchia C. Mortality from cardiovascular and cerebrovascular diseases in Europe and other areas of the world: an update. Eur J Cardiovasc Prev Rehabil. 2009; 16 (3): 333–350. Farinha JB, Dos Santos DL, Bresciani G, Bard LF, de Mello F, Stefanello ST, et. al. Weight loss is not mandatory for exercise-induced effects on health indices in females with metabolic syndrome. Biol Sport. 2015; 32 (2):109-114. Heshmat R, Shafiee G, Kelishadi R, Babaki AE, Motlagh ME, Arefirad T, et. al. Is the association of continuous metabolic syndrome risk score with body mass index independent of physical activity? The CASPIAN-III study. Nutr Res Pract. 2015; 9 (4): 404-410. Seven-Day Physical Activity Recall. Med Sci Sports Exerc. 1997; 29 (supl. 6): 89-103. Kunachowicz H, Przygoda B, Nadolna I, Iwanow K. Tabele składu i wartości odżywczej żywności. PZWL, Warszawa, 2005. FAO/WHO/UNU (Food and Agriculture Organization of the United Nations/World Health Organization/United Nations University) Human energy requirements, Report of a Joint 2021 AO/WHO/UNU Expert Consultation: Rome, 17-24 October 2001, FAO Food and Nutrition Technical Report Series, 2004. Jarosz M. (red.) Normy żywienia dla ludności polskiej - nowelizacja. IŻŻ Warszawa, 2012. Alberti KG, Zimmet PZ. Definition, diagnosis and classification of diabetes mellitus and its complications. Part 1: diagnosis and classification of diabetes mellitus: provisional report of WHO consultation. Diabetes Med. 1998; 15 (7): 539–553. Balkau B, Charles MA. Comment of the provisional report from the WHO consultation. European Group for the Study of Insulin Resistance (EGIR). Diabet Med. 1999; 16 (5): 442–443. Gallagher D, Heymsfield SB, Heo M, Jebb SA, Murgatroyd PR, Sakamoto Y. Healthy percentage body fat ranges: an approach for developing guidelines based on body mass index. Am J Clin Nutr. 2000; 72 (3): 694-701. Wasiluk A, Saczuk J, Litwiniuk S. Selected parameters of body build of candidates for physical education studies in the Institute of Physical Education and Sports in Biała Podlaska. Physical Education and Sport. 2003; 2: 239 - 253. Reuter C, Stein CE, Vargas DM, Bone mass and body composition in college students. Rev Assoc Med Bras. 2012; 58 (3): 328-334. Mleczko E, Januszewski J. Long-term trends of changes in physical and motor development observed among cracovian students. Kinesiology. 2009; 46: 65-79. Przewęda R, Dobosz J. Growth and physical fitness of Polish youths. University of Physical Education Editions, Warsaw. 2005.
de Freitas RW Jr, de Araújo MF, Marinho NB, de Vasconcelos HC, Lima AC, Pereira DC, et al. Prevalence of the metabolic syndrome and its individual components in Brazilian college students. J Clin Nurs. 2013; 22 (9-10): 1291-1298.